When facing challenging situations, it’s too easy to focus on the negatives – see the half-empty glass and not see a way forward. Adjusting our perspective to identify the positives- see the half-full glass, can help change our attitude and become more resourceful to tackle the situation. 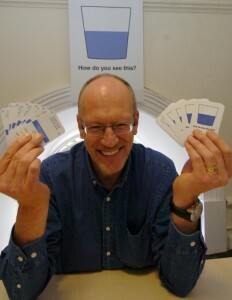 new habits developed the reframe card game "How do you see this?" to use in our work as facilitators and coaches. Participants use positive thinking in a series of negative scenarios. It can help them turn their attitudes round, to get more out of their jobs, improve performance and look on the brighter side of life. It works for a wide variety of activities where positivity is needed, including: assertiveness, coaching, leadership and teamwork events. Price: 1 pack - £25, 2 packs - £45, 3 packs - £67. Prices are subject to VAT & £2 P&P. ‘Family Life’ is an exciting project management game for teams, based around the fictional characters in the life of a busy magazine publisher. Get first-hand experience of managing projects by playing this compelling game. Take the challenge and play ‘Family Life’, test your project skills and see if you can beat the deadline! 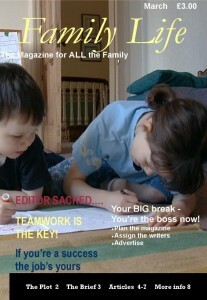 ‘Family Life’ is aimed at both new and experienced project people. It can be run as a one-off exercise or as part of a team building event. new habits ran ‘Family Life’ for us. It was our best offsite ever. Within seconds, people were immersed in the world of magazine publishing and determined to beat the management team ... which they did easily. It was fun, educational and fitted well with the development path we wanted to follow. Great stuff!